Magneti Marelli contributes to the Cyber Fleet System by supplying the telematic box for real-time data collection and transmission. The monitoring carried out by the Cyber Fleet System offers tangible advantages in terms of fuel consumption and safety, since the conditions of the tyres and, specifically, their inflation pressure, have a considerable impact on wear and on rolling resistance, determining appreciable changes in terms of fuel consumption, vehicle control, braking distances and useful life of the tyres. Hence, in the final analysis, the system allows a tangible optimization of the management costs of industrial vehicle fleets. The marketing of the Cyber Fleet System will now start in Brazil and will gradually be extended to other South American countries. As part of the Cyber Fleet System, the Magneti Marelli telematic box receives large quantities of data from the sensors applied to the individual tyres, implementing algorithms that make it possible to detect events such as the quick loss of pressure in a tyre (puncture), low pressure level, high temperature and the efficiency level of the tyres. The telematic box thus generates malfunction warnings or alarms and sends them to the Pirelli assistance centre. In addition to the information provided by the Cyber Fleet system, the Magneti Marelli telematic box is potentially capable of supplying information such as vehicle satellite tracking, monitoring of the driver’s driving style and crash detection, thus allowing fleet operators to have total control over their fleet of circulating vehicles. Magneti Marelli has been operating since the early 1990s in the area of telematic solutions aimed at “intelligent” and “connected” vehicles and, generally speaking, at sustainable mobility. 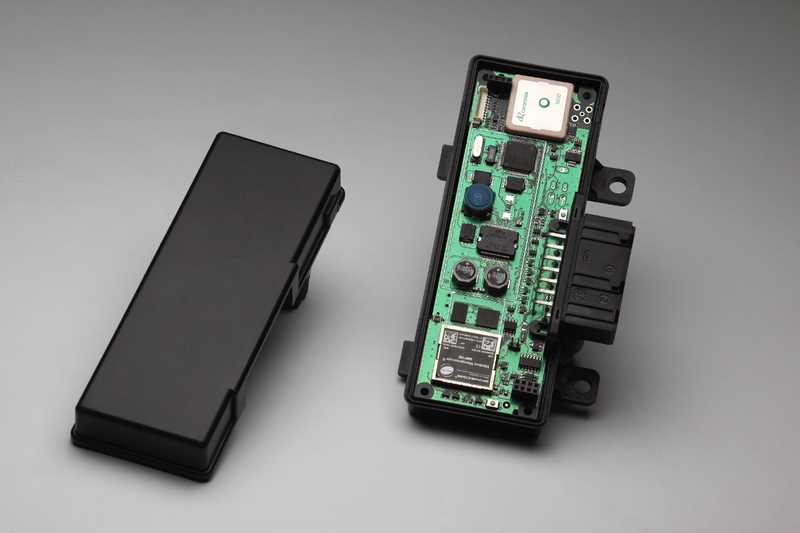 The telematic box is an electronic control unit that incorporates a GSM/GPRS module for wireless connection with communication networks, a GPS/Galileo/Glonass multi-constellation module for the satellite localization of the vehicle, and a triple-axis accelerometer to detect acceleration and braking parameters associated with direction. A device such as the telematic box, capable, at the same time, of detecting vehicle position and operating data and of sending and receiving information from the outside thanks to the GSM module, can fulfil multiple functions: vehicle protection and control (tracking); information on traffic, road conditions, parking areas, limited traffic areas; payment of tolls (e-toll); remote vehicle behaviour and diagnostics (tele-diagnostics); management of logistics and of industrial vehicle fleets; “insurance box”; automatic emergency call (e-call for quick rescue management) and car pooling. In addition to actually manufacturing the telematic box, thanks to its scope of activities and skills Magneti Marelli can cover other aspects of the value chain, such as, for example, box installation and maintenance, due to it being available on the aftermarket through its own capillary network of workshops and service centres. The expansion of telematics, which involves several players along a complex value chain (vehicle makers, suppliers of components and systems, of infrastructures and of services and contents), aims at providing technological answers to the new needs and paradigms of 21st century Mobility: the stringent need entails optimizing resources and creating a tangible system of sustainable mobility through, first of all, intelligent management of traffic flows, itineraries and logistics, and the monitoring of vehicle use for reduced fuel consumption, emissions and operating costs. At the global level, companies structurally depend more and more on their own transportation systems. Over the past 40 years, human mobility has seen a six-fold increase, two-fold in the past 10 years only. According to predictions, in 2050 global passenger-km will triple, and the movement of goods will quadruple (Source: Ambrosetti). With over 25% of CO2 emissions, 2 trillion dollars in annual global transportation costs, 1% of the world GDP going to traffic congestion costs on a global scale (Source: Ambrosetti) and various problems tied to road safety, commercial road transport is one of the sectors that mostly requires a new mobility model. In this reference scenario, Magneti Marelli is investing in and developing systems and technologies in the telematic and infotainment areas, for both OE (Original Equipment) and the Aftermarket, with the aim of making a significant contribution to sustainability, including with solutions suited to combining quality and competitive offer, technology and flexibility.